Home to the sartorially chic and renowned for its resplendent architecture, Milan is a bustling Italian city full of style and glamour. It is of no surprise that even in the realm of interior design, they are trendsetters. The Salone del Mobile Milano, one of the world’s largest interior design show held in April this year, got our team as tremendously inspired as we were excited about the event. The team visited the fair with an open mind, and here, we’re delighted to share with you the latest European design trends that our local home dwellers can easily take inspiration from for their very own abode. The focus is on urban aesthetics and in creating an interior that is cool and contemporary. Expect raw finishes that give the industrial style its urban vibe: like concrete, bricks and burnished metals. When it comes to the colour palette, turn to neutrals that veer slightly towards the darker side. But take note, you don’t want your home to appear overly masculine. Offset clean lines and raw edges with a bit of curves and soft furnishings to make it more welcoming. Like for example, plush couches with a slightly curvaceous silhouette. A blush of copper in the form of lighting or accessories also adds femininity without steering away from the urban vibe. Europeans love to host and to entertain. Whether you prefer more intimate gatherings or a get-together with many, an open-plan layout helps to make your space more sociable. If space permits, set a kitchen island at home. Not only do they offer more prepping and storage space, they can double as a place for mealtimes as well. What’s more, they make absolutely great zones for entertaining. Nature’s beauty is undeniably enduring. This is why references taken from the natural world are ubiquitous. Inject this timelessness into your home with veneers crafted from or made to mimic wood and stones like marble. These surfaces can be used to clad countertops, floors and even walls to give your dwelling an atmospheric vibe and a distinctive appearance. In fact, rustic surfaces such as log patterns are on trend right now. Its characterful grains and patterns enliven a contemporary setting, while its warm wood tone infuses a cosy aura into your space. The meticulous attention to the finest of details is highlighted throughout the design showcases at the Salone del Mobile Milano. Bring the same discerning quality into your home with elements, items or furniture pieces that are unique yet elegantly so. For example, a sculptural light fixture that is, on its own, a work of art. When hung atop a dining table, it becomes the room’s centerpiece. Or you could utilise classic inspired handles and pulls that will add refinement to sleek cabinet fronts. Above all, a home should be a functional place for its owners. To keep up with the demanding lifestyle of the modern dweller, thoughtful and smart design should be an integral part of home. On show were numerous innovations in kitchen furnishing and homeware as well as automated systems designed to ease everyday chores. 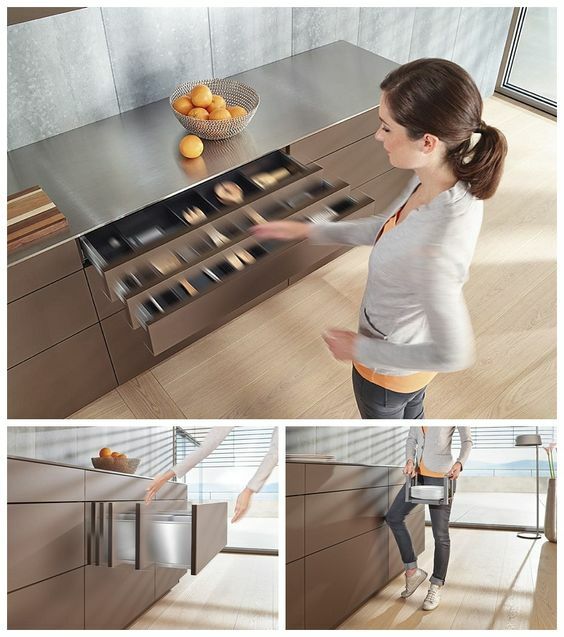 Take for instance, international brand Blum’s extensive range of systems that makes working around the kitchen that much effortless. We love how its nifty motion technology, the TIP-ON BLUMOTION unit lets you open and close drawers with utmost ease – no matter if you have your hands full when cooking up a storm or if you’re reaching for the remote control in your media console unit. The herringbone pattern is timeless yet undeniably on trend. Typically spotted on floors, this pattern is slowly making its way up on walls as an eye-catching backsplash in the kitchen or on a feature wall in the communal zone. Stick to wood textures to stay true to tradition, or jazz it up with coloured or white tiles.